The National Geospatial-Intelligence Agency is one of a kind; a community of professionals generating a unique type of intelligence for both the national defense and direct combat support. It’s not always easy to understand what members of Congress are thinking. For example, in the months leading up to the current recess, there was a great gnashing of teeth over U.S. acquisition of Russian space hardware—in particular, the RD-180 main rocket engine. Out of the 7,110 satellites launched since October 4, 1957, 44 percent of those are, either primarily or secondarily, military in nature. Historically, the protection of satellites has relied on the physically remote location and the fact that satellites were treated as a single entity to mitigate threats. To respond effectively to conflicts and humanitarian missions cross the globe, troops have depended upon satellite communications (SATCOM). 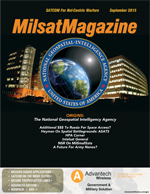 The Continued Emergence Of SATCOM BLOS For Airborne ISR, By Garr R. Stephenson, Jr., Head of the Airborne Comms-On-The-Move (COTM) Business Unit, UltiSat, Inc. When then-Lieutenant General John E. Hyten offered his perspective on the value of Space Situational Awareness a year ago, he was, in effect, outlining the qualifications of his successor as Vice Commander of Air Force Space Command, Major General David D. Thompson. Flex For Better SATCOM, By Kay Sears, President, Intelsat General Corp. Similar to many people, I have a smartphone that I use for email, texting, phone calls and many other daily tasks. Selecting US General Hyten as the keynote speaker for the SmallSat conference in Logan, Utah, may have surprised some, given the nearly non-existent adoption of small satellites within the US Military’s operational space architecture to date. One Army project is making the future of satellite communications more responsive to Soldiers’ needs.